Many of you who are baking the gluten-free breads from our book have asked about making the dough without eggs. I had heard that using ground flax as a replacer was an option, but honestly I doubted it would work. Well, I am happy to report that I was wrong. I’m not sure yet about the science behind this substitution, but it works and provides a wonderful alternatives for those with egg sensitivities. I found this egg replacer on the wonderful Vegan Baking post. 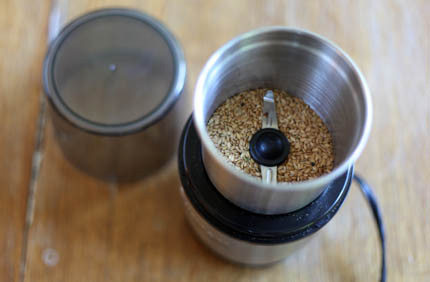 Grind the flax seeds in a Spice Grinder until it is a fine powder. Stir together the powered flax with 1/3 cup of water. After the mixture has sat for about 3-5 minutes will get gelatinous and quite egg like. It is a great science experiment for the kids! For more details on how to mix and use the dough see chapter 9, page 235 in Healthy Bread in Five Minutes a Day. You can also find more details here. 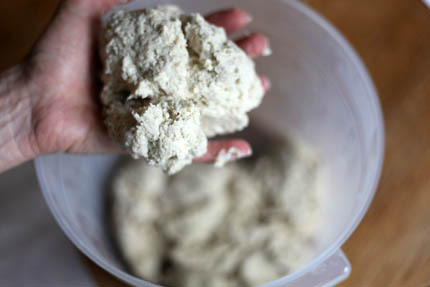 Once the dough is well chilled reach into the bucket with wet hands and pull out 1/4 of the dough. 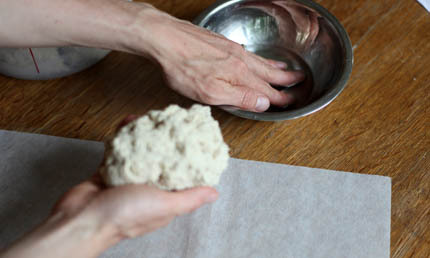 Dip your hands in more water to prevent the dough from sticking to your hands as you work. 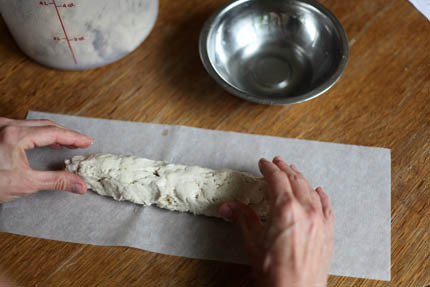 You want to press, squeeze and gently pull the dough into the shape of a baguette. This dough has no stretch to it, so you can’t pull it too hard or it will rip apart. The good news is that you can always just press it back together. 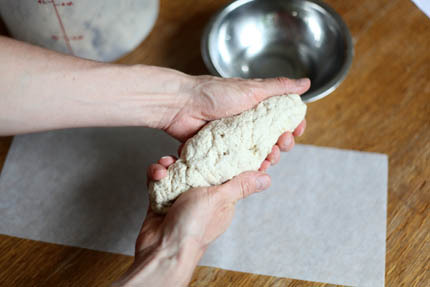 If the dough is too soft to form in your hands then just place it on a thin sheet of parchment and form the loaf with wet hands right on the paper. Try to handle it gently so as not to compress all of the air bubbles out of the dough. brush with water and then loosely drape with plastic wrap. Let the dough rest for 40 minutes. Preheat your oven to 475°F for 30 minutes with a Baking Stone on the center rack and a Broiler Pan on the bottom rack. Sprinkle with seeds (I used the mixture from HBin5 on page 54). Place the baguettes, on the parchment, into a Baguette Pan. This way the bread keeps its lovely shape and you can get more into your oven at one time. 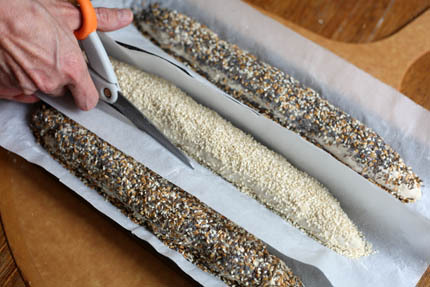 Using a sharp Serrated Bread Knife slash the baguettes at a diagonal three times 1/4-inch deep down the loaf. 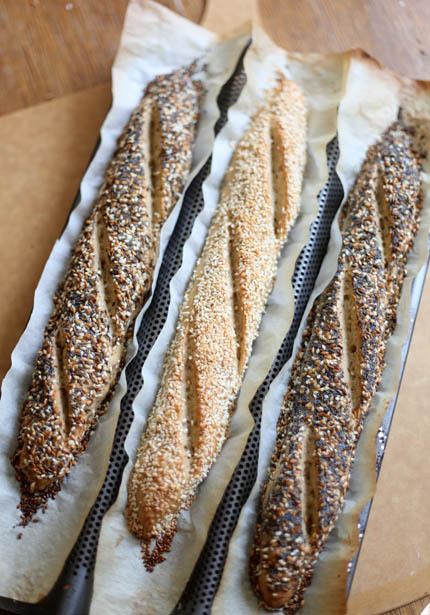 Place the baguette pan onto the preheated stone, add 1 cup of hot water to the broiler pan and bake for 30 minutes. Allow the bread to cool on a wire rack and then enjoy! Love the new book HBi5. However, I am having problems with the dough being too wet. I have cut back my liquids by 1/3 to 1/2 cup in the recipes? Dough still too soft to gather into ball, even with wet hands. Been spooning into a loaf pan so it can raise. Any suggestions? I’m wondering if the master recipe can be baked in a loaf pan? 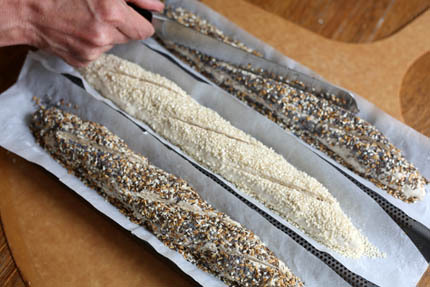 Val: The GF breads are significantly wetter– but if you want to dry it out more, just decrease the water a little more and see what you think. Otherwise, yes, you do handle it kind of sloppily as you suggest– but it works. Thank you for helping us to prepare breads that actually look and taste great, plus have no eggs! 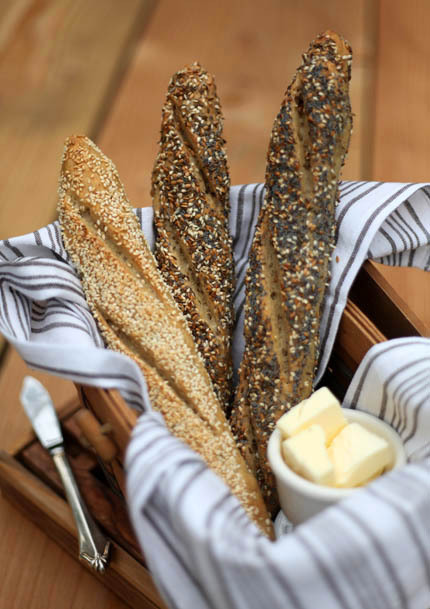 I am so glad you are enjoying the gluten-free breads! I’m happy to hear you are trying the recipe without the eggs. I made these baguettes with the master gluten free baguettes with the master gluten free recipe, using the flax seed concotion instead of eggs, and they turned out great. I actually like the eggless version better. Like I said in a comment from few days ago, I love you Zoe and Jeff! These GF breads are fantastic overall, and not just as a GF bread. Well, that’s good, Prunella, because all you need is love 🙂 Thanks so much– I’m so glad this recipe works so well for you. No GF brioche forum…so I figured I will post it here. Sorry for a flood of comments, but my excitement about GF breads can’t be contained. I wanted to let you know that I made GF brioche dough (used whipping cream instead of milk for some added fat!) and it turned out beautifully. I rolled it paper thin and made tiny crescents (2-3″), brushed them with some cream and sugar before rolling, and they are absolutely amazing. They did not rise as the one regular ones in your book…but if I may say so, they are better! They taste exactly like medialunas from Buenos Aires (http://erinskitchen.blogspot.com/2006/11/buenos-aires-morning-ritual-cafe-con.html); actually they are the best medialunas we ever had (I could still eat gluten when we were there). And this statement is not just coming from me…it’s coming from my gluten-eating husband, who keeps asking for more. He also likes your (wheat) baguette (which turned out well, though I found that I have to let it rise for about an hour to 90 mins). And, as for GF bread, I am feeding half of my celiac neighbuorhood and we are all addicted to it! Making gluten-free people bread-happy is not that easy, and you guys have done it! Thank you so very much! Just found out I am celiac. Can’t wait to try your recipe. Thanks so much. This is great! I teach baking classes at my local co-op and have been pleaded with multiple times from an egg free recipe for GF bread that actually has good texture. 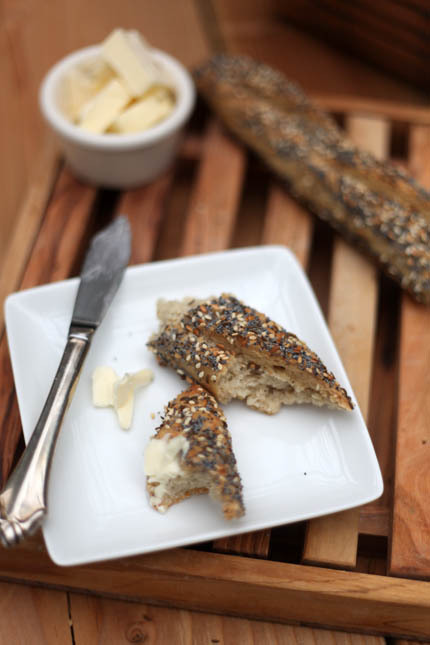 Have you tried the flax gel with your regular GF bread recipes? No, I haven’t tried the glax gel, but will check with my co-op to see if they sell it. Is there a brand you have used? Paula and the rest of us who have been searching for a bread recipe with flax gel that really works!! I really hope you and your son enjoy this recipe. Thank you for your note and we will continue to explore more g-f recipes! Zoe and Jeff, I just bought both of your books (I’m a bit behind, I know!) and made a perfectly beautiful loaf of ciabatta. And it was so easy! I am thrilled! I am even more excited to try the GF recipes, and was so happy to ind this post, as my 3 yr old son has been diagnosed with numerous food allergies including gluten, dairy and eggs. 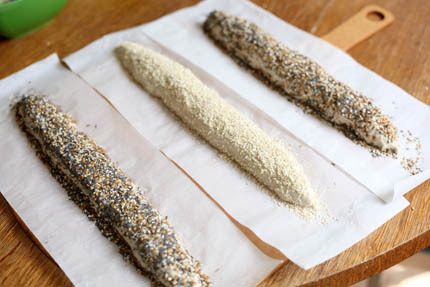 Can’t wait to try these baguettes and the rest of your GF recipes with the flax egg substitute. When I said “flax gel” in my previous post, I was referring to the slurry you make from flax meal and water. After writing my note I tried the replacement of eggs with flax meal and water (flax gel) in your “Not So Rye” Bread. I had great results. I actually like the bread more without the eggs. Now if I could get my results with the dough whisk to be as good as mixing with the kitchen aid I would be happy as a clam. Jenn: OK, confusion solved; yes, the intention was to use the flax/water mix to replace eggs in the recipes– any bread recipes that call for eggs. Surprised the dough whisk isn’t working as well for you– we’ve gotten good reports on that. I came to your blog today to ask you about this, and I’m happy the answer’s already here! I’d been happily making your recipes from HBin5. But yesterday, we found out our son is allergic to gluten, wheat, dairy and eggs. keep the flax seeds and any extra ground flax in the freezer. It goes rancid if stored too long at room temp. You’ll be able to tell by the smell if it is bad. Thank you sooo much for the information. My daughter is a culinary student. Therefore, most of the dishes she does are not GF. We like to take the challange and try to convert them to GF. This way she can enjoy it since she has Celiac and is on the GF diet. Cant wait til I try this recipe!!! Thanks again. thanks for the link to this book and the kaf products. i am crossing my fingers for this contest! Baking parchment question: am I doing something wrong? Everytime I make baguettes from HBi5, including the 100% WW Olive Oil recipe, the bread sticks to my dry parchment. Do I need to oil the parchment first? Katherine: Assuming you are in fact, in Brussels Belgium, it’s likely that you don’t have exactly the same parchment available that we do. The stuff we use is silicone coated and it does very well in this situation, and is rated to the temperature we bake at (check that). When we’ve bought parchment labeled “pastry parchment,” it sticks. Maybe it’s not silicone coated? I want to thank you for your work with gluten free flours. While I am not able to afford your HBin5 book, having a gluten free family can be quite expensive to support in a low income home, your ideas and techniques have saved me many costly trials of error. Many thanks for your time and dedication! I’m curious if you have tried other egg substitutes, such as corn starch in water (2 TBSP corn starch to replace an egg) or Energy-G gluten-free egg replacer? I have found the corn starch substitute to work well in quick breads, and just ordered your book, so maybe will try it in a gluten-free recipe. . .
Hello! I was wondering wish of the gluten free recipes in your books will work better for making “hand held” pies. I have all of your books ;-)! I haven’t tried any of the gluten free recipes yet however that will be changing soon. My little one has severe food allergies and I’m sooo looking forward to baking her some home made bread and hopefully “hand held” pies that she can take to school for lunch. What kind of fillings are you planning to put in the pies? I would use the gluten-free pizza dough for savory fillings and the brioche for sweet fillings, both from the Artisan Pizza Book. How do you reccomend storing the gluten free boule? Should I slice it and freeze it? I can’t eat a loaf in one night all by myself! And btw, thank you, thank you, for a great gluten free recipe! If you think you will go through it in a couple of days you can leave it out and just cover it with a clean dish towel. If it will take longer to eat it, then you may want to freeze the sliced loaf. Thank you, Zoe. I am sharing this recipe, and your books with everyone I know! One more question about the gf boule…the crumb did come out a but sticky and wet. With your regular boule, I just decreased the amount of flour, and increased the rest time to 90 min. My regular loaves always came out so perfectly delicious after making those adjustments. Friends and family asked me what bakery I got my bread at! Do you think decreasing the amount of water in the gf boule would help with the sticky and wet crumb like it did in the regular loaf? I thought I would try taking out 1/4 cup of water to start. Also, I always weighed my flour when making the regular loaf. Do you recommend weighing the flours with the gf loaf? Ok, last question….I love King Arthur Flour, and would love to try their gf all purpose flour. Is there a way to use their gf flour to replace all three flours in your gf crusty boule? Or, could I use the dough from your gf baquette recipe and just form that into a boule? Sorry for ll of the questions, and thank you, again, for making gluten-free actually taste great! So sorry, in my previous post, in the beginning, it should say “decrease the amount of water” not flour! Kim: decrease the amount of water, yes, until you can handle it. Don’t go too far. There are more tips on GF in Healthy Bread in Five Minutes a Day. Can try the KAF product; we haven’t but it might work. Will take some experimentation. And sure, use the weights tables in HBin5 in Chapter 4 to convert the recipes. Might help. Thank you for the lovely note! Enjoy all the bread. For the GF Brioche, is it possible to sub King Arthur’s bread mix? And if so, is additional corn starch needed? I presume the flax gel egg sub works with this recipe as well? It is hard for me to find in local stores (and in general) GF flours that are also nut free. 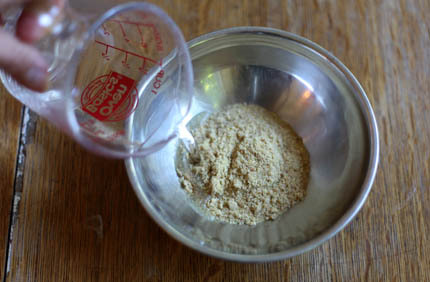 The more I can substitute w/ King Arthur GF flours, the easier life will be! Thanks! This may take some experimenting. The brioche dough is richer, with more egg and butter. You can try adapting the King Arthur flour to give you that result, but I would start with a small batch and see how it goes. I wouldn’t think you’d need to add any more cornstarch to the mix. The flax should work, but I have not tried it with the King Arthur products. I finally made the GF bread and it turned out great! I made some substitutions: used GF all purpose flour instead of tapioca and sorghum, used pectin instead of xanthan gum, and added extra flax-egg substitute enough for 6 eggs. I really liked the result, though I never made the original recipe so I cannot compare. Can you tell me how many tablespoons of flax comes from the grinding process? I already have ground flax. (a lot of ground flax) Thanks! Your recipes look amazing! Hey guys, I just made the baguette from the book, and the crust (on all three loaves I’ve made, actually) never comes out looking as browned and crisp as it does here. I use parchment and a baking stone, heat to 450 degrees (using an additional thermometer), pour water in a tray, and bake for the suggested times, or longer. It’s just always a little pale. The bread is always still delicious but I’m just hoping for a nicer presentation (and truly crusty crusts!) Any advice? Thanks! How long are you preheating your stone? You can always try the shelf browning technique, which simply requires you to put the loaf on the top shelf for the last 5 minutes of baking. The heat is more intense up at the top of the oven, so it tends to brown better. I’m preheating for at least 30 minutes. I will definitely try to move the loaf to the top shelf the next time I make a batch of the boule dough. These last two weekends have been for brioche and the olive oil bread, though! Both are absolutely incredible. I made regular brioche, cinnamon rolls, and a chocolate brioche twist last week, and made pizza with the olive oil dough last night–which tasted like real, straight-from-the-pizzeria pizza. Pizza Fridays are back in our house for sure! Have you guys tried to make calzones with the gf olive oil dough, by any chance? With the brown rice flour dusting I would think that it would be sturdy enough to fold, but I did have a lot of trouble rolling the filled brioche so I’m wondering if I’ll encounter a similar issue (though that dough seems a lot more delicate anyway). Yes, I think the dough would work well as a calzone, but folding it over is the tricky part. 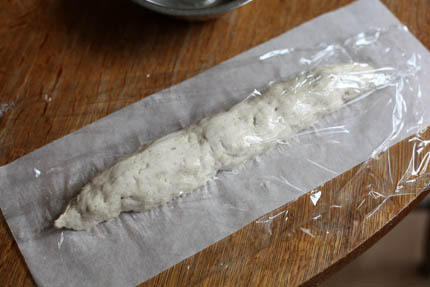 If you roll the dough out on a an oiled piece of parchment, you can use the parchment to fold the dough over. It will be a similar method as the cinnamon rolls you made with the brioche. Please let me know how it goes. I will give it a try as well. I have not been successful w/vegan wheat free bread for my autistic boy who is allergic to wheat. I thought this recipe would work, but after 30 minutes the inside was still gummy and smelled sour. When I made it, i let it rise for 2 hours, and it wasn’t super risen, and then when I put it in the fridge, it fell. Suggestions? I”m desperate. Did you make any substitutions in the recipe? Did you allow the loaf to cool before cutting into it? For recipe differences: I cooked the flax seed a bit as a friend had told me. Should I just mix it at room temp instead? I put in 2 t salt b/c salt inhibits yeast and I didn’t want to put in the full tablespoon. I had slightly less than the full amount for the tapioca flour — 3 scant cups. So then I didn’t put the full amount of water in, I did 1/4 cup less and took a look and it seemed like it was the right consistency, based on your vid. (I was raised w/o storebought bread, jam, yogurt, granola, soups or sauces, and I had to do 1/4 of the kitchen work, so I’m confident in the kitchen). After I posted yesterday, I put the bread back in and baked it 20 more minutes until it was super crusty. Then I sliced it lengthwise to get it drying from the inside out. My child ate it w/a lot of salt on top. Encouraged, I put the opened loaves back in the cooling oven for 10 minutes to dry them out. He really likes them at this point with ALOT of salt (3 weeks into his wheat-free life he’s desperate for something). So I thought I’d bake the rest of the dough as thin (1 inch or less) snakes rolled in salt, a kind of pretzel stick feel. But I still don’t understand why it’s not raised up at all, w/2 t of yeast. (This happened w/another recipe from another site I used — it never rose at all; taste-wise it was okay the first day, but inedible w/in 2 days). When I make wheat bread,I’d use more yeast than that for that volume of flour. If I make a regular baguette loaf and just bake it until crusty and let it cool, will it stay gummy inside? THANK YOU so much for your care and concern in this — I really appreciate it. My child is 6 feet and 195 pounds, and being allergic to milk, wheat, peanut, and soy, and being a vegan by choice, is a big headache for me. Try it without heating the flax, I’ve never tested the recipe that way, so it may be changing the nature of the dough. G-F recipes, in my experience, are much more finicky and less tolerant to even the slightest changes. Are you making a full size batch of the dough? If so, make sure you are using enough flax to replace the 4 eggs? The recipe was tested with the full amount of salt, so I am positive it will not effect the rising of the dough. You can feel confident to add it to the recipe. You said you are using 2t of yeast (a small “t” means a teaspoon) which is far less yeast than the recipe calls for. We call for 2 tablespoons. Or maybe that is what you meant to write? Make sure the water you add isn’t too hot or it will kill the yeast. Do you have an oven thermometer? Underbaking can often be the result of an oven that is running too cool. Okay, you got me. Classic newbie’s error. I put in 2 t of yeast. NOT 2 T. So… No wonder! I don’t know if I read it wrong or if lingering issues from a concussion last month (yes! ), or if I just couldn’t believe it’d take 2 TABLESPOONS, which is so much more than in wheat, since I baked bread every week for YEARS, and just was on auto-pilot. But thanks for taking the time to doublecheck and help me out. I will have to find bulk yeast and try it again next weekend! (I’ll have to doublecheck the other recipe I tried that failed; may be the same problem!). I hope that does the trick! Let us know and enjoy the bread. I wanted to let you know I make this every week for my son now! It seems to come out differently every time and I’m not sure how exactly to adjust what I do, but since he eats it anyway, I just go with the flow. His doc wants him to cut out peanut and soy now, so he wants me to bake this bread like a loaf to make a sliceable loaf he can try w/almond butter. I don’t own a dutch oven or a stone — can I bake the boule loaf at 450 for 40 minutes? Would that be about right? Do I knock on it to determine doneness as I would do w/wheat bread? The boule loaf didn’t work, it was okay but very solid. I probably made it too big. Today I tried the dough with the full amount of water and it was damp and fluffy. My baguettes were probably a bit bigger (fatter) than yours — 3 used up about 3/5 or 2/3 of the dough. After 30 minutes the inside was still damp. I don’t know if that’s b/c the dough was wetter or b/c I make bigger baguettes. What shoudl teh texture of “done” baguettes be like if split when hot? Biggest thing: you really can’t use our breads when they’re hot. Our stuff tastes soggy when hot. Let it cool completely or you just won’t be happy with the result. And yes, smaller baguettes will be easier to succeed with. My son cannot have wheat, neither yeast. 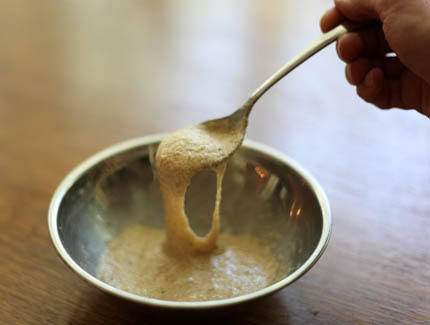 Do you know whether this recipe would work with baking soda instead of yeast? Our doughs are meant for yeast, since they are stored for a number of days. Baking soda acts instantly and can not be stored long term once it is mixed with liquids. I am in process of making a batch of dough using the no knead recipe. But my wife is gluten intolerant so I used Cup 4 Cup flour in place of the regular flour. Have you tried this flour before and if so what we’re the results like? We have not found that this brand works well in bread, unfortunately. Which of our books are you using, can direct you to our GF recipes. Or here on the website. Thank you Jeff. I baked two loaves yesterday and brought them to a dinner party (brave, I know!). But they turned out well. Even our friends liked it, they thought the taste was great and really liked the density of the bread. I have used Cup 4Cup for my pasta and love it for the almost regular flour taste and this bread was similar to that. So thanks for the great recipe. I found it on a blog that was referring to your Artisan Bread in Five Minutes book. Great. GF recipes appear in our 2nd two books, Healthy Bread in 5 (http://bit.ly/3wYSSN), and Artisan Pizza and Flatbread (http://amzn.to/eo10NJ). I’ve made the vegan version several times & it’s always soo tasty (tho I do think it’s a little different than yours)! I just have a question about my dough rise… it rises beautifully around 1+ hour but once it’s in the fridge, it falls back down at least 1″. Is this normal? I think if it didn’t fall, the bread would be even more tasty & light. I do continue to let it sit out for the full 2 hours as written. Any suggestions? Less rise time? I agree. Once I put the dough in the fridge, it turns into sorbet-like consistency. I just bake it straight from the rise — I avoid the fridge now. It sounds like the dough is too wet, are you making any substitutions to the dough? This is actually normal for our dough, to rise and then collapse slightly in the refrigerator. The gluten-free doughs actually do it less than the wheat doughs. You can certainly try letting it rise for less time, especially if you are using instant yeast and the room or water is warm. I see that the eggless version calls for the flax equivalent of 2 eggs, while the GF Crusty Boule original recipe calls for 4 eggs. Is the direction for the 2 egg equivalent correct for the full recipe? Yes, the baguette was intended to be a lighter result. Thanks for this question and clarification–it’s exactly the question I had. I will be making these in the morning to serve as bruschetta for a party tomorrow night. I’m so excited to try it out! I found your site on a google search. If these turn out well for me tomorrow, I’m definitely buying the GF breads book! Thanks for sharing some recipes online to try out! And in the book, our Master Recipe defaults to an egg-free version. The version with egg whites is lighter (see page 73 of the book, which is similar to what’s here on the site). I have made this bread recipe several times and it is amazing! Best gluten free egg free bread I have made and it is also potato free which works well for me because I also have to avoid nightshades. Thanks so much for creating such a great recipe- I practicially have no options for store bought bread, so its nice to know I can make my own at home. I am going to make more today- I want to do some baguettes and then try one in a loaf pan since I don’t have a dutch oven. What are the calories if 1/5 of this recipe is eaten?